The taste of a well-crafted pear-flavored martini is an experience. This French Pear Martini takes that to a new level of sophistication and elegance and adds a touch of sparkle to the occasion. The French Pear Martini is a very modern cocktail. It combines two great spirits -- pear vodka and St. Germain -- that are relatively new to the market and it puts them together in a beautiful way. The combination of pear and elderflower is amazing. It is delicate, floral, and has a very spring-like feel. Add to that a hint of sparkling wine and a fantastic cocktail is born. Best of all, it is very easy to make and it is perfect for many different affairs, from an elegant dinner party to a casual Sunday brunch. Pour the liquors into a cocktail shaker filled with ice. This cocktail is very simple and you do have a few options with each of the ingredients. The Pear Vodka. We have a nice variety of pear-flavored vodkas available on the market today. 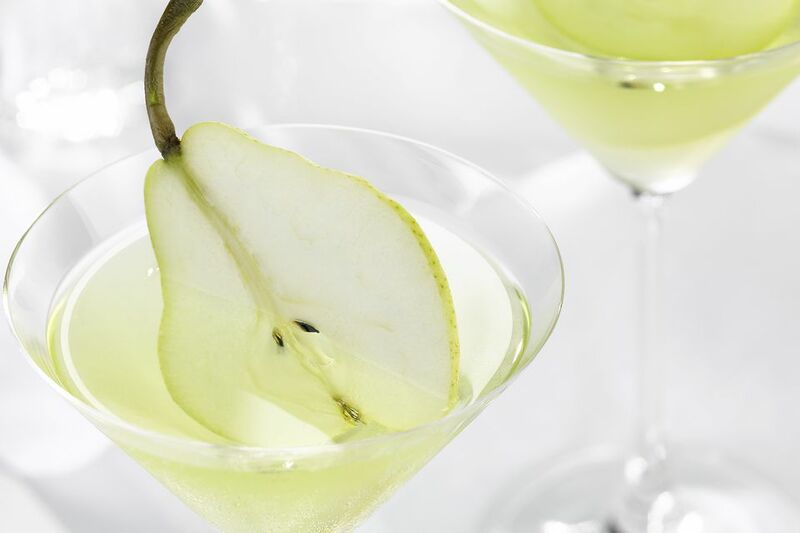 Grey Goose La Poire is undoubtedly one of the best options and it would be my top choice for the French Pear Martini. If you feel the desire to make your own pear vodka, it is very easy. Choose your favorite vodka and cut up a couple of pears. Combine the two and allow it to infuse for 1 to 3 days until it reaches your ideal flavor. When choosing the vodka, keep quality in mind. This martini deserves a smooth, clean vodka and the pear will only enhance the spirit's base flavors. The Elderflower Liqueur. St. Germain's release to the commercial market opened up a new world of light, floral cocktails for everyone. Before this, it was difficult to enjoy elderflower cocktails and you would need to make your own elderflower cordial. While that is still fun to do, St. Germain is available almost everywhere and it is just so much easier. The Champagne. You really cannot go wrong with your choice in Champagne for the French Pear Martini and, actually, any sparkling wine will make a great drink. When reading Champagne labels, the most important thing you need to remember is the difference between brut and sec. Brut means that the wine will have a distinct dryness. Sec indicates a sweeter wine. How Strong Is the French Pear Martini? This French Pear Martini recipe looks sweet and innocent, but you may notice that all of the ingredients contain alcohol. Though mild, it may not be as weak a drink as you think. With a 12 percent ABV Champagne, this martini has a final alcohol content of around 25 percent ABV (50 proof). It is not out of line for 'martinis' and is slightly stronger than the original gin martini.